Loss of appetite (Anorexia) is a common symptom in children. Acute illness in childhood is often associated with transient loss of appetite. Prolonged loss of appetite associated with poor weight gain or loss of weight usually signifies a serious chronic illness, either organic or psychogenic. Pathophysiology: Th e mechanisms that regulate hunger and satiety are complex and redundant, remaining incompletely understood. Both appetite-stimulating and appetite-suppressing neuropeptides are secreted in the hypothalamus.Central control of appetite is influenced by anticipation of a pleasurable meal, visual and taste sensations, ambient temperature, and changes in blood levels of glucose or other nutrients, as well as by limbic signals from higher central nervous system (CNS) regions. Each individual may have a set point for body fat content. Cytokines are key mediators of the appetite suppression that occurs with acute and chronic illnesses. 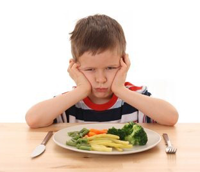 Approach To A Child Presented With Loss Of Appetite: When considering anorexia, the physician must first separate complaints based on unrealistic parental dietary expectations from justified parental concern over a child’s diminished nutritional intake. In the former situation, the child is typically growing well and appropriately thriving. Although significant GI disease commonly leads to poor appetite, anorexia may be the result of disease that is distant from the bowel. In the newborn period, poor oral intake by an infant who is developmentally capable of feeding may be the first indication of a major disorder, such as sepsis, meningitis, urinary tract infection, congenital viral infection, a GI anomaly, CNS disease, renal failure, or an inborn error of metabolism. An acute infectious disease is a common cause of transient anorexia in infants. If no obvious explanation exists for poor feeding, then the pediatrician should always consider the possibility of an oral disease (eg, thrush). Emotional deprivation is a common cause of failure to thrive and lack of interest in eating : a thorough social history is essential to the evaluation. Generally, the best approach to anorexia is to treat the underlying condition. 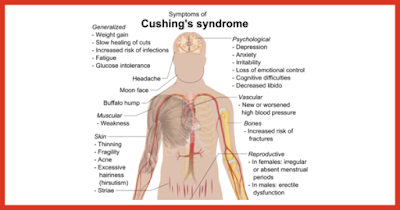 Cushing Syndrome: Causes, Symptoms, Diagnosis And Treatment. 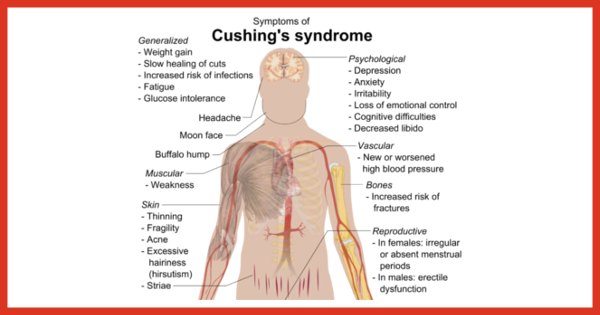 Introduction: Cushing syndrome is an endocrinological disorder and it describes the signs and symptoms associated with abnormally high levels of the hormone cortisol. Cushing syndrome is also known as Hypercortisolism. 1. Use Of Glucocorticosteroid Medicines: The most common cause of Cushing syndrome is the excessive use of corticosteroid medicine. Prednisone, dexamethasone and Prednisolone are the examples of these medicines. The glucocorticosteroid given externally mimic the actions of the body,s normal hormone cortisol. These drugs are mainly used in the treatment of asthma, skin allergies, inflammatory diseases, etc. A pituitary gland tumor that release too much ACTH leading to excess stimulation of adrenal glands to produce cortisol. Tumors of the adrenal gland that produce excess cortisol. Tumors elsewhere in the body that may produce ACTH or CRH. • Visual and hearing impairment. • Urinary tract and other infections. Intrauterine fetal demise (IUFD) refers to fetal death prior to delivery and may occur at any time prior to delivery. The process of tissue degeneration (maceration) is due to the effects of autolytic enzymes on the fetus in a sterile environment. Lysis occurs at the epidermal- dermal junction with subtle changes in the gross appearance of the fetus. Skin desquamation and positive Nikolsky sign can be seen as early as 6 hours. Further changes involve desquamation and bullae formation of the face, back, or abdomen by 12 hours, at least 5% of the body surface at 18 hours, and generalize skin desquamation at 24 hours. Sloughing of skin from a large area indicates a prolonged interval between death and delivery. Mummification occurs after approximately 2 weeks.